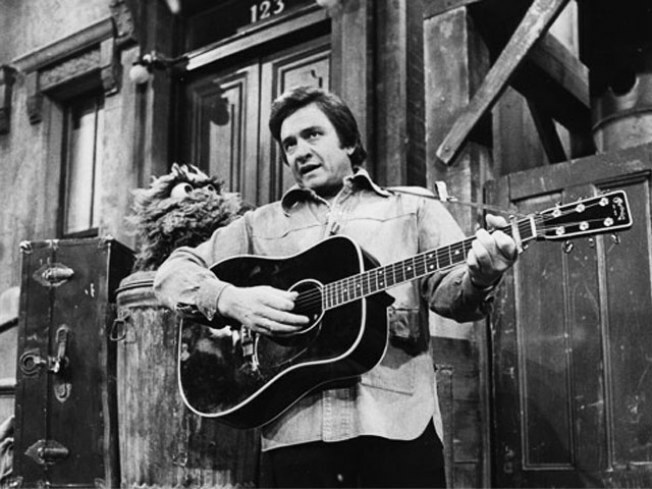 Oscar the Grouch and Johnny Cash in an early musical moment from "Sesame Street". - Sesame Street at 40: Milestones on the Street: This “best-of” compilation features classic Sesame moments, such as the series’ first episode, Maria’s visit to Puerto Rico, the birth of Gabi, Miles’ adoption, the death of Mr. Hooper, and when a hurricane hits Sesame Street. -Jim Henson & Friends: Inside the Sesame Street Vault: Jim Henson and his early Sesame Street collaborators through old favorites and rarely seen clips from specials and TV guest appearances. -Sing! Sesame Musical Moments: This salute to 40 years of Sesame Street music features original Sesame Street classics, parodies, and special guest appearances by musicians such as Billy Joel, Paul Simon, R.E.M., Patti LaBelle, Johnny Cash (pictured), and more. -A Special Sesame Street Christmas: Features the Christmas Eve on Sesame Street episode plus excerpts of other Sesame holiday moments, including clips from Elmo Saves Christmas, Elmo’s Christmas Countdown, A Sesame Street Christmas, and Muppet Family Christmas. -Sesame Street Film Festival: Highlights the short films that have come out of Sesame Street since its inception—including animated classics like “Ladybug Picnic,” Pixar shorts, and live action segments like William Wegman’s dogs. For full program and schedule, visit BAM.org.